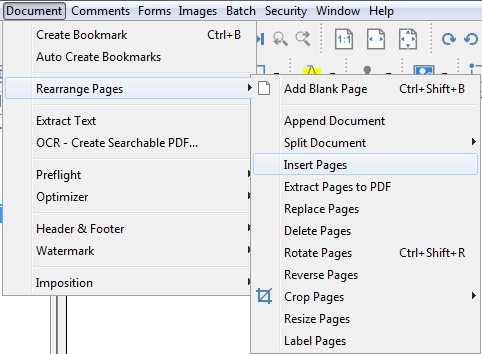 Q: How can I insert pages in PDF Studio? A: PDF Studio can insert whole PDF documents or specific pages from a PDF document at a location you specify within the currently opened PDF. Select Document > Rearrange Pages > Insert Pages From PDF from the menu and choose a document to insert into the current document. You can also insert pages from another PDF document by opening the PDF in question and dragging the thumbnails of the desired pages into the current document Thumbnail pane. Copy – Select and drag thumbnail pages from the source document to the destination document’s Thumbnail pane of the second document. Move – Select thumbnail pages from the source document. While holding Ctrl, drag the pages to the desired location within the Thumbnail Pane of the second document.